I feel ya, girly -- You can do it; you're almost there! cute photo :) I like the vintage feel of it! And think it's still thursday in Oslo! Oh dear. Get better soon. SO so sweet! I often feel like this on Fridays too! I'm sorry you are feeling kinda crappy, but that picture is way too cute! Kick back and relax today. You earned it. awww ... what a sweet photo. i hope you are feeling much better soon. That's how I've felt all week. I'm glad this week is almost over. Aw, it's Friday though! The weekend is within reach! its almost friday then TGIF :) i hope you feel better soon hun! 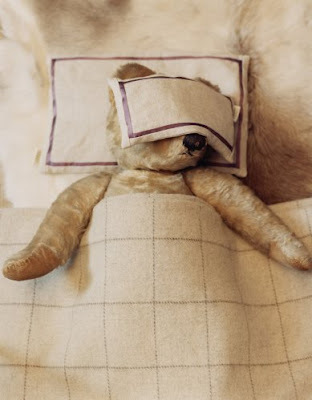 I'm feeling a little like this teddy bear, today. I wait that you feel good! Hope you feel better soon. I have the same problem...they actually asked me not to come into work. Okay, no problem! Hope you are feeling better Kellie. Such a cute picture and I know exactly how you feel. sometimes you just need to give yourself a day off ... maybe just curling up on the sofa with a good book or silly chick flick will do the trick and cheer you up. and know what you mean. Hope you feel better. Those lamp shades should make a difference ;-) Lovely colors. Adorable and hilarious and sweet! I hope you feel better Kellie! no good when we are feeling a bit blah.